Before we brought home our Airedale puppy, Bailey. We researched dog breeds to be sure our puppy had the right temperament, the right health requirements, and that he would grow to the right sized dog. One thing we didn't research is how quickly poo can pile up from one little puppy. The EPA estimates that one dog can excrete 274 pounds of waste per year, depending on what and how much the dog eats. We think Bailey reached that limit in his first 6 months! While it's easy to dispose of dog waste during the day, it's hard to see it at night, so we frequently let lay, intending to pick it up the next day. That first winter, it snowed often and heavily. By the 'next day' the poo was hidden in snow piles. However, after winter comes spring. That spring, when the snow melted, we had a yard full of poo. Although some folks recommend digging a hole and burying dog waste, the USDA cautions that it can pollute ground water as well as surface water. Putting it in your garbage makes landfills a bigger health hazard than they already are and garbage collectors complain that poo bags burst and make a real mess of their trucks. I'm an avid flower gardener so the first thing that came to mind is compost. I wondered if you can compost dog waste. Well, yes you can. Even in the winter. In fact, composting the right way produces a safe soil amendment that destroys dog waste pathogens such as E.coli and salmonella. One word of caution though, the USDA warns that even composted dog waste should not be used on food crops or in areas where children frequently play. There are several methods of composting dog poo. 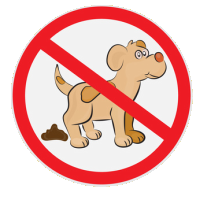 A USDA pdf lists two of them along with all the facts need-to-know facts about dog waste. One excellent do-it-yourself tutorial shows you how to build a dog waste composter from salvaged materials.If you prefer a ready-made dog waster composter, try the Doggie Dooley. Composting dog waste is just one small step you can take towards a cleaner, healthier environment and believe me—less spring cleanup!